It really is too darned hot today. I know, I spent part of the early afternoon outside washing dirty, stinky dogs. After that, I retreated from the 97 degree heat and umpteen-eleven percent humidity and took a shower, and have been hiding out in the air-conditioned house since. I might only emerge to pick the tomatoes that are ripe on the eight foot vines on the deck, and after that, perhaps make a salad for dinner, and that is all. But, what else will I put in the salad? Because, oddly enough, I crave really hot and spicy foods when I am miserably hot. I think it is because they make me sweat, which cools me off. So, later tonight, it will be the chiles, the fish sauce, the palm sugar and the lime juice I will reach for to make salad dressing for those lovely little gemlike tomatoes! Let’s take a look at the first batch of entries I recieved for this event and see what folks all around the world make when they want something that is too darned hot! Now, we head off to Santa Fe, New Mexico, where Christine of Christine Cooks Vegetarian teaches us the art of making beautiful from the local red chiles. The dried pods she shows in one photograph are gorgeous cherry-red and smooth–definately a chile to be reckoned with. 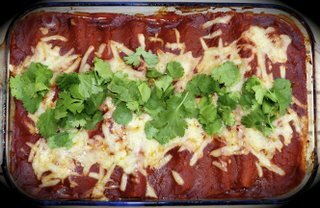 The finished enchiladas look delectable, too–with a deep burndished red sauce, white cheese and brilliant green cilantro–my mouth is watering already. Combining the chiles with four other types of dried, powdered chiles, onions, garlic, tomatoes and cumin, Christine really aims to wake up the palate of omnivore and vegetarian alike with her delicious looking sauce. As if that wasn’t enough, she fills her enchiladas with a combination of black beans and baby squashes. Now, that sounds way tasty to me! Great entry Christine–I hope we see you again next time! Nupur of One Hot Stove always makes my mouth water with her descriptions of the food she has eaten and cooked in and around her native India, so it is no surprise that her Mushroom Chettinad has gotten me all hot and bothered. 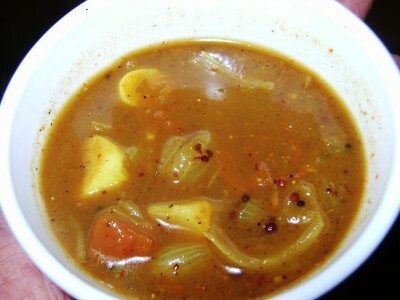 She uses a mixture of wild mushrooms in it, with a very simple, but gorgeous-sounding spice blend of tamarind, cilantro, curry leaves, mustard seed, dal, black peppercorns and chiles to turn a vegetable which is often very plain into a sultry sexpot of a supper. 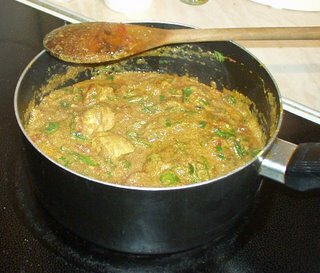 And look at the beautiful photograph–I love the karahi she is serving it in! The next time I get some mushrooms in my CSA box, I have a feeling that I am pulling out this recipe–thank you, Nupur! 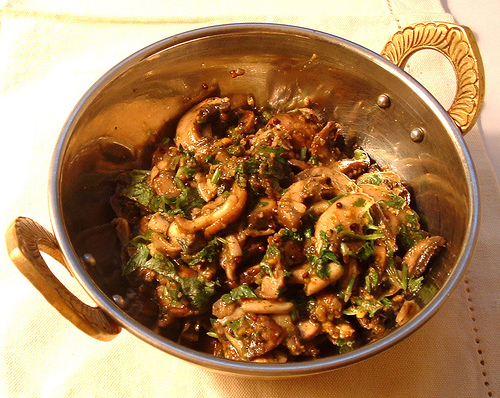 I really appreciate anything that combines mushrooms and chiles–it is mixture that not many people think of. Keep bringing the flavors of India home to New York City! Macky always has something interesting cooking in her kitchen in Manila at The Edible Garden, and this entry proves it, most deliciously. 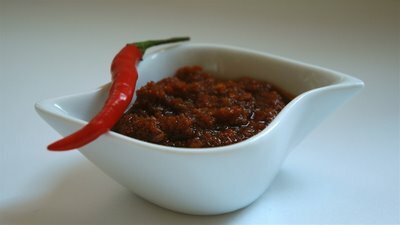 She makes an adapted recipe from Lex Culinaria: Spicy Onion Jam: a sweet, hot and sticky concoction red with tomatoes, sweet with onions and sugar, and spiced with red chile flakes. It is a lovely condiment that I bet would go splendidly on top of a goat cheese and basil tart with a pinenut-spiked crust. I’m looking forward to what Macky has to share with us in the future, too! I am happy to see that Shammi from the UK/Indian food blog, Food, In The Main has come to join our game this time around, because she loves spices, chiles and garlic as much as I do! I love the sound of the dish she presents to us, where chiles join a melange of other spices and seasonings to create something that she says may not be authentic but tastes really damned good on rice! Her Garlic Kaara Kuzhambu includes shallots, garlic, chile powder, turmeric, fenugreek seeds, dal, mustard seeds, cilantro, and curry leaves. As if that wasn’t beautiful enough, she gives a recipe for her garam masala mixture that she sprinkles over the dish to add extra fragrance–and wouldn’t you know, it includes more chiles, along with black peppercorns, cumin and coriander. It sounds absolutely ravishing–too darned hot, indeed! Thank you, Shammi–I do hope you join us again next month! L.G. writes her blog, Ginger and Mango from her home in Kerala, India, and I love reading her descriptions of the native cuisine there. 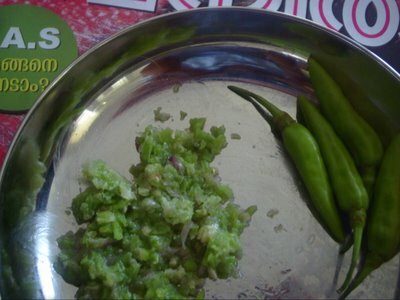 I cannot help but be excited to see her post for this event, as it is another way to make my best beloved fresh green chutney, which we just call “Green” around this house. I am even more excited, because she describes the chile (kanthaari) used in her Kanthaari Mulaku Chammanthi, haari, which she thinks may not have a name in English. Which of course, means, we can’t likely get it here, but I don’t care, because it is a mystery, and mysteries are cool. Especially culinary ones. Looking at the chile in question, it looks rather similar to a Thai bird chile, but I trust that the flavor is probably very different–chiles are highly variable in shape, color, and flavor. What is most interesting about this chutney, is that it contains only three ingredients: shallot and kanthaari chile ground in a mortar and pestle and blended with a bit of coconut oil. It sounds divine to me–and I am even more thrilled to learn that intelligent girls and women in Kerala are called “kanthaari” which means lioness or tigress, after this wee, but aparently fierce chile. Thank you for sharing with us, LG, though now you know, I will have to figure out if I can find seeds to grow your chile here in Ohio! Haalo hails from Melbourne, Australia, where she writes Cook (almost) Anything At Least Once, and because of her, we are going from green to red. 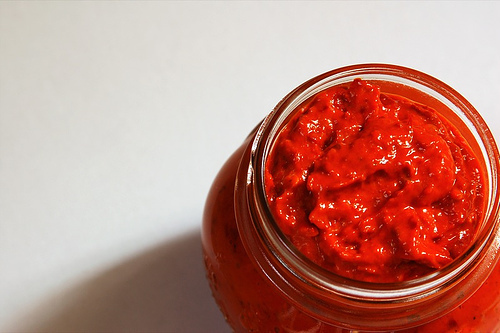 Yes, she presents us another fiery chile condiment, but instead of it being green and from India, it is fire-red and from North Africa: Harissa. And Harissa is really hot. I mean, like really. Look at her recipe. It requires 80 Chinese chile peppers. That is right. 80. Yeah. That isn’t a typo. It also contains a respectable amount of garlic, and some cumin and caraway, but most of what harissa is about is beautiful, scarlet chiles with temperments and temperatures to match the flaming color. It is used both as an ingredient and a condiment, though, so it isn’t like you are supposed to eat it all on its own. But, however it is supposed to be eaten, it sure is beautiful–thank you for sharing that lovely photo with us Haalo, and come back next time–I want to know what you have up your sleeve for next month! We have another new face to welcome here–Sheherazade, the author behind the UK blog Feeds Two Hungry People. I have to congratulate her on her choice of recipes; she presents a luscious version of of Karhai Chicken From Madhur Jaffrey’s Ultimate Curry Bible, a work she consults for quick, tasty curry dinners often. And no wonder–look at the lovely results she gets! 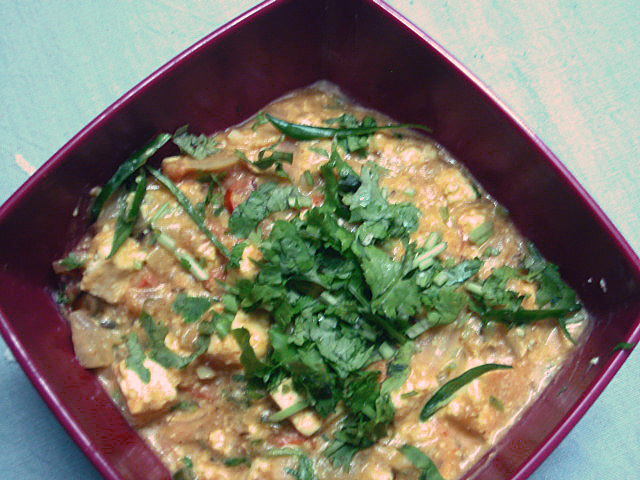 Two kinds of chile go into this yogurt-based curry: dried cayenne and green fresh chiles. I don’t know about you, but I can smell the verdant aroma of the fresh cilantro from here! Thank you very much, Scheherazade, and I very much hope to see you again next month. Jennifer is from Baton Rouge, Louisiana, where they looooove the hot and spicy food. It is most definately one of the regions of the US where the chile pepper reigns supreme, so of course the author of The Weekly Dish had to participate in this round of The Spice is Right, and what does she bring us? Oh, only something that has this pregnant lady wanting to jump up from her keyboard and rush to the kitchen to make me up a plate of Blue Cheese and Mango Quesadillas with Mango Salsa. It has blue cheese (which, yes, I am allergic to, so even though I love it and love the sound of it in this recipe, I would have to substitute it with something else, like maybe a good sharp chevre). And mangoes. And chiles and salsa, and it sounds sooo gooood. 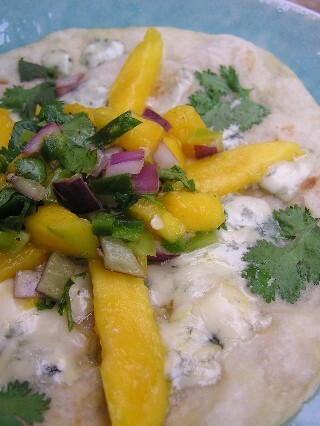 And it is very pretty, too–just look at all the colors in that salsa: violet onions, emerald green cilantro and buttery, rich yellow mangoes. (I love colors almost as much as I love food–you should see our house–it has paint as bright as the colors of that salsa.) I am about to short out my keyboard with all of this drooling. Jennifer–I hope you come back next month, too, because I want to see what is Fresh and Local in Louisiana in August! Allright, that is it for tonight. Look for more of the round-up tomorrow, and then on Tuesday, as I post in between doing laundry and packing for our trip. I hope you all are enjoying reading this round-up as I am having writing it–it is a priviledge to be able to look in on so many kitchens across the world and comment on what is being cooked there. Thanks again to all the participants–without your mad cooking skills, The Spice is Right would not be half as fun and rewarding as it is. What a delightfully written round-up of scrumptious-sounding spicy food! Thanks for taking the time to peer into our kitchens and report back. I can’t wait for the rest! Wow, all our entries look wonderful, I am enjoying reading everyones recipes. Thanks for this challenge Barbara. And now I know how to do the links too! Great fun, and lots of new ideas. I’m enjoying this and look forward to reading the rest of the recipes. Next time, I’ll join in! Lovely round-up Barbara! As always your time invested in doing the round-up is truly amazing and I thank you for it. Great recipes and great ideas! It really is incredible the wonderful dishes that everyone comes up with. Great round up. Thanks Barbara, this is wonderful – I can’t wait to try some of this stuff and I’m drooling just thinking about what else might be in the other round-up posts. I’ve been so looking forward to this roundup. And so far, it’s worth it! What terrific new ideas already – and this is just part 1! And, part II is up! Thank you everyone–it is great to know how much folks appreaciate the round-ups–they are fun to write! Hugs all around–everyone did a great job!